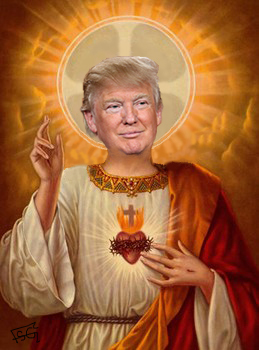 I've heard a lot of people ask how Christians could possible back a misogynist, racist, narcissist, liar like Donald Trump? First off, it helps to understand that the religious right was once referred to as the Moral Majority, despite being anywhere near honest (or with morals) about what they really stood for. The first clue is that the majority of the religious right's members are white. Always have been. Resistance to racial integration helped unite conservative evangelicals in the 1960s. They developed their own political agenda after losing a landmark court case - Green vs Kennedy. It ended the tax-exempt status for private Christian schools known as "Segregation Academies." A myth then arose among the evangelicals that they were so morally outraged by the Roe vs Wade decision (which came after Green vs Kennedy) they resolved to organize and overthrow it. The fact is they organized to protect segregated schools, but it's leaders tweaked the evangelical movement's real purpose and seized upon abortion as it's main mission. Hypocrisy meets hypocrisy, and there's a marriage made in hell between Trump and the white evangelical cult. As long as Trump furthers their hypocritical aims he's going to get a pass on anything stupid, or mean, that he does to millions of Americans.